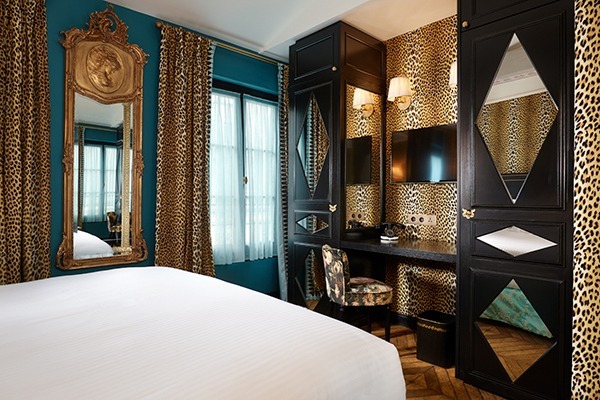 The Hotel de JoBo, located in the heart of Paris’ Marais district, has opened its doors. Situated close to the Place des Vosges, the eccentric residence was inspired by Napoleon Bonaparte’s first wife and muse Rose Tascher de la Pagerie, nicknamed Joséphine. 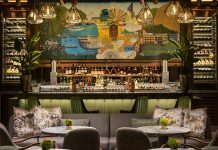 Suitably, the property channels Napoleonic aesthetics and design styles, including mosaic tile and marble bathrooms, beams bedecked in roses, and a life-size campaign tent in the lobby. 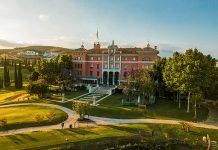 Built on the remains of a 17th century convent, the property aims to channel the spirit of Joséphine Bonaparte with eruptions of roses, multiple tones of pink, lozenge shaped motifs, arrows and the marquetry of the period. Sloan reinterprets the style of Directoire with humour and playfulness, incorporating wall coverings from textile manufacturers Le Manche, Somalian leopard print, and carpets of her own design. The design is inspired by the Directoire style right down to the detailing of all the carpentry. 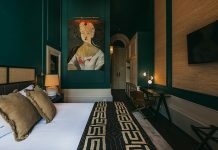 Guestrooms reflect the decor and style of the period whilst bathrooms are tiled with Marquina and Carrara marble mosaic like those of Ancient Greece, a popular fashion for the 18th century elite.